Actress Tabu Instagrammed a delightful piece of throwback gold on Tuesday. It appears that the sepia-toned photograph has been in safely locked in Tabu's archive for decades and that she only recently stumbled upon it. 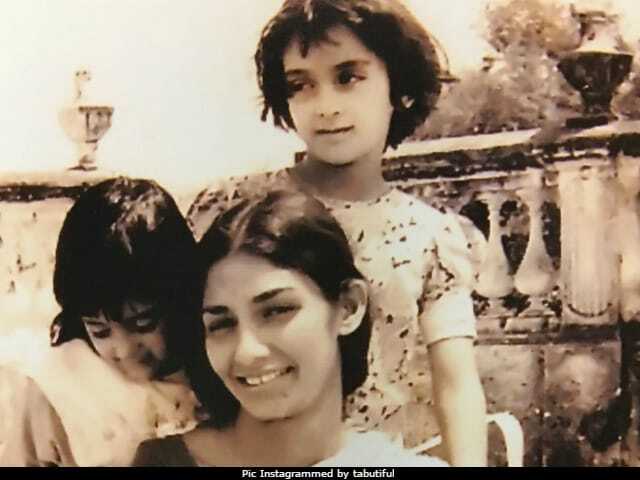 The old picture features a younger version of Tabu, her elder sister, actress Farah Naaz and their mother (Now we know Tabu looks like her mother). In the picture, Tabu appears to be not more than four or five-years old and visibly oblivious of the photo session. The photograph appears to have taken on the roof of a traditional Hyderabadi Bungalow and will instantly remind you of those lazy Sundays spent making achaar with your grandmother in the attic. "The colour of memories... Mummy, bahen and Chanda the possessive one," Tabu captioned the pic on Instagram. Tabu was born as Tabassum Fatima Hashmi in November 1971, soon after which her parents divorced. Tabu grew up with her maternal grandparents in Hyderabad and later moved to Mumbai in 1983 for college. She studied in St Xavier's College for two years after which she made her full-fledged debut in 1985's Hum Naujawan. That is also the year when her sister Farah stepped into Bollywood with Yash Chopra's Faasle. Farah remained one of Bollywood's most sought after actresses till the early Nineties during when she shared screen space with leading actors such as Rishi Kapoor, Rajesh Khanna, Sunny Deol and Sanjay Dutt. She's also worked with Anil Kapoor and Aamir Khan and is best known for films like Yateem, Imaandaar and Isi Ka Naam Zindagi. Meanwhile, Tabu has completed over two decades in Bollywood and is popularly known for her roles in films like 2001's Chandni Bar , 1997's Virasat, 2000's Astitva and 2003's Maqbool. Last seen in Fitoor, Tabu stars in Rohit Shetty's Golmaal Again.